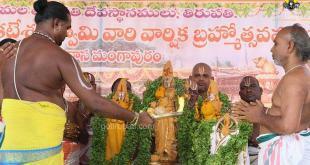 Sri Ramanuja made 3 visits to TIRUMALA and contributed to a great extent. 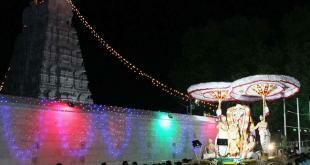 During his third visit when he was about 95 years, he framed certain rules and regulations to be followed at TIRUMALA. He ordered that delicacies should not be prepared at home and had to be prepared in the temple and after offering it to Perumal, the same could be consumed. He also ordered that all the flowers in TIRUMALA Hills should be offered to Lord only and that mortals should not wear flowers as the fragnant flowers could cultivate some unwanted desires in us which could result in loss of sanctity. bachelor all through his life would be fit for the post. After discussing with TIRUMALA Nambi and Anantazhwar, Sri Ramanuja selected one of the disciples of Anantazwar, initiated him into Sanyasa Ashram and gave him all the powers of temple administration. He named him “SENAPATHIJEEYAR/VISHWAKSENAEKANGI” as he was supposed to protect Aiswaryam like Vishwaksena. Sri Ramanuja ordered a matam (a place of residence) to be constructed for the Jeeyar near Bedi Hanuman temple (As the Jeeyar was supposed to be like Hanuman in all aspects especially Brahmacharyam), gave him the idols of Sri Rama,Seetha, Lakshman and Hanuman which he received when he was learning Ramayanam and ordered that Nitya Thiruvaradhanam to be performed daily to this deity, presented him with a ring with Hanuman’s figure engraved on it, temple keys, a staff, a bell and a tridhandam. He also ordered that all the activities of the temple right from opening the temple upto closing the temple in the night should be done in the presence of the Jeeyar. He also ordered that the temple keys should be kept safe with the Jeeyar and Jeeyar alone will have the right of offering Dhoopam Deepam, neivedyam to Moolavirat , supervise Saatrumarai, Thirumanjanam and other activities. He ordered that only brahmacharis known as Ekangis would be allowed to touch the Divine body of the Lord and once the archaka gets married, he loses the privilege of touching Lord’s Divine body. Even today, after Ekantha Seva, the Bangaru Vaakili doors are closed and sealed and the keys are handed over to the Jeeyar. 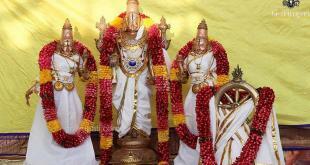 Next morning, the keys are brought by the Jeeyar and in His holy presence, the temple doors are opened.